Where have I been?....and New Fabric! Wow! Where has the summer gone? I have been so lame in getting a new post to the blog!! I apologize for this lameness....maybe I can blame part of it on the blazing Texas heat (which was brutal in July I might add). I am actually working on some pretty exciting stuff, but some of it needs to stay under wraps for a little longer.....I will reveal it as time progresses...promise! What I CAN talk about is a new bag design that will be coming out this fall. It is, shall we say, eco-friendly, super easy to make, fun to use, and even more fun to sew for all of your friends! Photos will be coming soon. I have some testers out there who will be giving feedback on their prototypes...you know who you are! I also have another bag design floating around in my head that I hope to get into my sewing room and work on this week before I lose the mental image. I literally dreamed about it. Those usually seem to be the best ones! Anyway, once it is actually in existence and it passes my scrutiny, it may appear here also. In the meantime, here is what I received on my porch late last week. 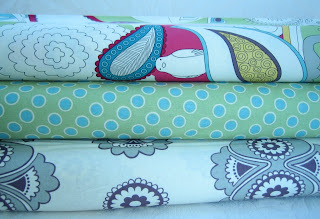 It is three prints from the new line, 1974, by Urban Chiks for Moda fabrics. I think it is way cool! The scale is HUGE with lots of interesting stuff in it....like birds here and there and doodles that resemble peacock feathers, paisleys, etc. I just love the large medallions and can't wait to get this stuff made into bags and whatever else strikes my fancy. Be sure to check this fabric out at your local quilt shop. I have also stocked my fabric stash with some new stuff from Tina Givens's Chloe's Imagination line, Tanya Whelan's Ava Rose line, and of course, the new Heather Bailey stuff. I am eager to use all of this great new fabric in designs for my fall line.....many exciting new things to come! Be sure to check out all of their fabrics in my blog and fabric designer links I have listed here at my blog. I am also testing out a stabilizer called Peltex. It is similar (I am told) to Timtex. I never actually used Timtex and hear that it is being discontinued. I did use a fusible version of Peltex (one side was fusible....they make a double sided version, but is way stiff!) on a Bridget Bag for one of my friends as a birthday gift last week and really like the way it turned out. I plan on testing it with some of the new bags I will be working on and will be sure to share my thoughts as I venture into sewing with this new find. I know it will not hold a crease as well as good old buckram will, but for bags that don't require that, it may be a good substitute. It is also machine washable (buckram is dry clean only), so that is a plus. Anyway, I will be sure to post to the blog as soon as I have my opinion formed on this stuff and if you should try it or not. I guess that is about it for now....hope all of you are busy sewing....I know that school is just around the corner for most kids now....that means hopefully more sewing time for some of you!